Greetings! I hope this issue of Holsten Galleries News finds you and your families well and enjoying the spring weather. This month I have some extraordinary works to share with you. I hope you enjoy viewing them and I welcome any comments or questions you might have. "We need the technique and we need the idea. And then we need the poetry, the love that transforms the material into a piece of art." A new indoor/outdoor Chihuly installation show will take place at the Atlanta Botanical Garden, April 30-October 30. It is titled "Chihuly in the Garden." If you are in or going to visit Atlanta please make it a point to view this beautiful and inspiring exhibition where nature and art not only complement each other but also begin to lose their separate identities and blend together in a magical way. One of Lino’s classic series of glass sculpture is the "Dinosaur" series. At 58.75" high this is one of the tallest examples of this series that I have seen in recent years. The bold yellow color and the proud, elegant form combine with the gracious cane work and the intricate surface carving to make this Lino piece a standout. 22" x 30" x 14"
Many of you might think of Karen Willenbrink-Johnsen as the Seattle glassblower who was once a key member of William Morris’ team and who herself creates beautiful, lifelike owls. 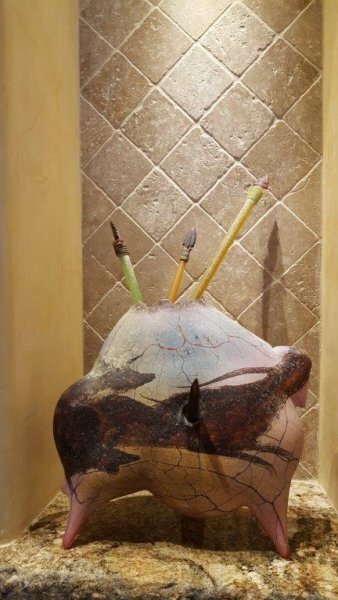 If that is your concept, you will find this new piece by Karen to be quite a departure from her other forms. To me this Peacock is one of the most beautiful and intricately crafted figurative glass sculptures that I have seen in many years. This secondary market glass sculpture from William Morris’ highly regarded Artifact series is a great example of what many collectors might now consider to be Morris’ classic period. I particularly like the fact that it is much more colorful and translucent than many of William’s other works. It is featured prominently in the book WILLIAM MORRIS ANIMAL/ARTIFACT. 14" X 15" X 14"
11" x 21" x 5"
This new piece by Preston Singletary is a wonderful example of his work. The whale has been an important part of the life and mythology of Singletary’s native Tlingit culture. There are more and larger areas of translucent red in this piece than in many of Preston’s work. These are, of course, a result of removing portions of the black outer layer of the sculpture. To me this piece has a slightly fierce but mostly playful feeling to it. I am very excited to be sharing with you a new series of work by Asheville glass artist Alex Bernstein. 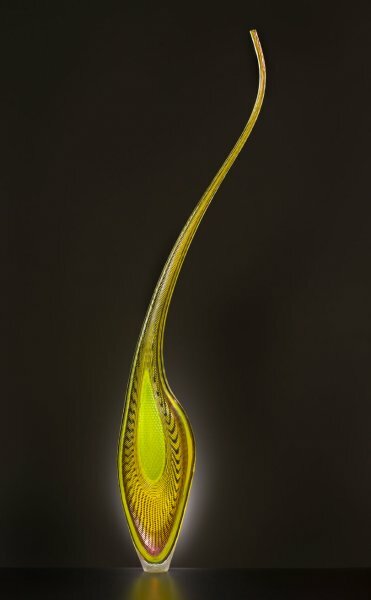 In this series, Bernstein continues to use the same glass casting techniques that characterize his other series but in other ways this series is a departure and moves his art to a new level of sculptural integrity and sophistication. This becomes quite clear in the two examples I share with you here and you can see more by visiting this page.